12th June 2011- 1400 Hrs- Malari Village, Chamoli, Uttarakhand. When I saw him for the first time he looked older than all the 74 springs he had weathered. The lines on his wizened and bronzed face amplified his age. We had finally managed to meet the oldest shepherd of Malari. As soon as we started our brief enquiry about the Girthi Ganga valley, Bhuwan Singh- the shepherd, started an animated description of the route. As he spoke, one could see the sparkle in his eyes, as if he had gone back to his heydays. “ तीन दिन लगेगा साब. पहले दिन "पानी उड़ार", फिर "दूम पानी" और तीसरे दिन हम गिरथी पहुँच जायेंगे .” – his confidence was contagious. “पानी का थोडा दिक्कत है …” he went on. A small crowd was gathering around us, all of them retired shepherds, all loving to add their little bits of information about the route. Half an hour later, Bhuwan returned after bidding farewell to his family, a big “Tilak” on his forehead and a bottle filled with some milky liquid in his hand. “एक मिनट रोकिये साब यहाँ पर ” - Bhuwan suddenly spoke up as I drove us back to the campsite. His eyes were already closed in a reverential prayer, as I watched him offering obeisance in the direction of the temple, about 100 meters below the road, to our left. He ended it by offering the bottle of milky liquid, emptying its content on the way side. “माता का मंदिर है . काली माता ! ऊपर वाले का आशीर्वाद होना चाहिए साब !”. Then I realized, even for the seasoned campaigner, this was a challenge; a challenge that he was accepting, praying and offering his homemade “Chhaang” to Goddess Kaali. Somehow, the experience was entirely refreshing. Something about him was absolutely natural, transparent and one inspiring confidence. He was in for an adventure at the ripe old age of 74, when most others would prefer to mind their worldly chores. An adventure that would be on for two weeks and a hundred Kilometers through such terrains that only he knew and we had only read about. The team was now complete. As I researched more into the proposed route, the romance of it grew on me. 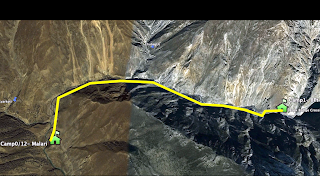 Here was a route that was logically a shorter connect between Malari and the famed trade route between Milam and Gyanema Mandi in Tibet. But it could never ascend to its potential popularity because of its level of difficulty. Only four different traverses were recorded in the annals of mountaineering through this route. There is not much description available about the first two traverses, but both Murray and Kapadia describe in some detail the difficulties one faces in crossing the 20 Kms between Malari and Topidunga through the Girthi Ganga Valley. In due course the team was formed consisting largely of the past members from Guptkhal, Kagbhushandi and Lamkhaga teams. 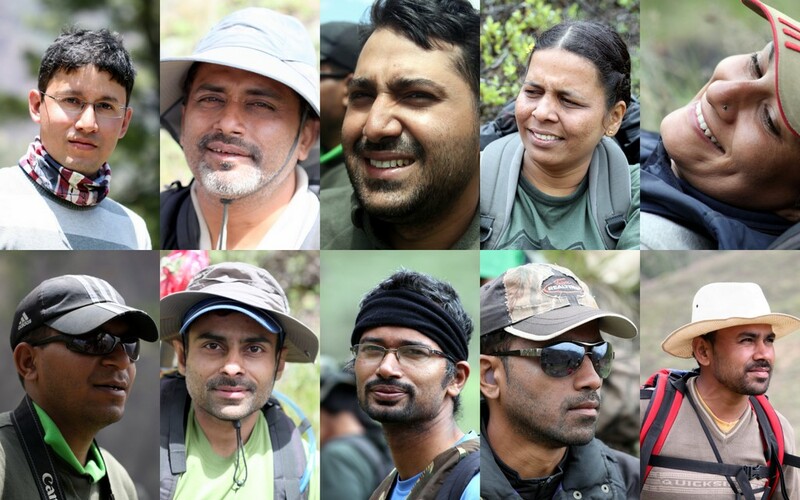 Half the team was trained and certified in mountain craft and knew each other as well. The only new members were Pawan from Bengaluru, Kaveri from Delhi and Kalyani from Mumbai. If we attempted the route, we were going to be the 5th civilian expedition in the 200 years old recorded history and the first one with women in the team! The bonus was the likelihood of spotting rare wildlife (snow leopards have been spotted in the Malari area in the last two years), in this territory that was so rarely visited by human beings!! Thus began our summer adventure for 2011!! Reaching Joshimath two days ahead of our proposed start of the trek, we soon realized that the adventure had already begun. The challenge of crossing the Girthi valley was not so much about the terrain, but much more about the permissions that are required from a multitude of agencies. After two full days of running around in various departments of the administrative machinery at Joshimath, we finally obtained the papers by the late evening of 11th of June. That already meant a delay of 24 hrs for our itinerary, we were supposed to be camping that night at Malari rather than Joshimath. 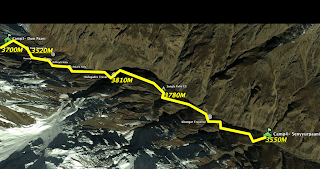 There is a route that leads upwards, away from the traditional pilgrim route to Badrinath, near the Joshimath Bus Stand where one can see a milestone reading- “Tapovan- 15 Kms”. For someone who had visited Joshimath some 6 times in the last 10 years, it was indeed a discovery, for the road becomes almost deserted after about two kilometers of drive along it, very unlike the pilgrim route to Badrinath. The road winded along deep valleys and the horizons filled up with tall snowy mountains. Before long, one could see the mighty Nanda Devi looking down benignly upon the vale of Dhauliganga. 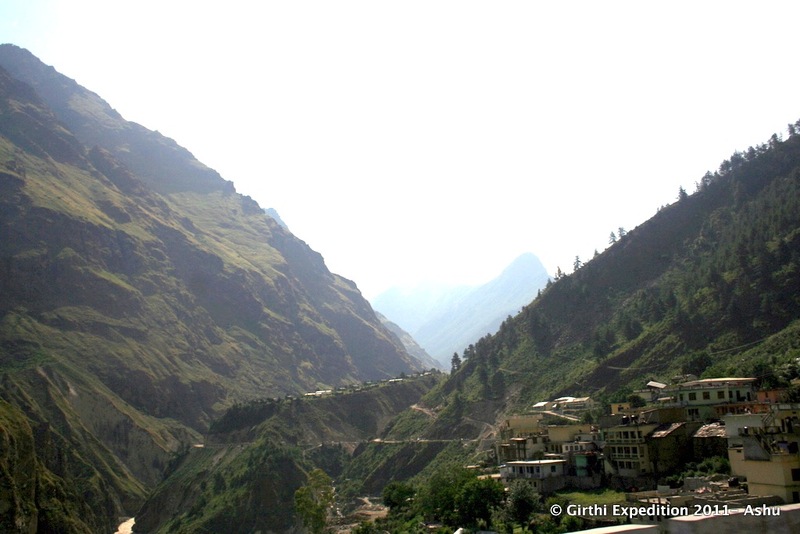 Beyond Tapovan are the little hamlets of Lata, Rinni and Jumma as one steers through the 65 odd Kilometers to Malari. Deputy Leader, Prof Suraj Mal, who had earlier done extensive research in this area, continued to provide a running commentary about the topography as we enjoyed the pleasant drive. Soon we went through the Marine Drive of Suraithota after which the road conditions dramatically deteriorated. The Border Roads Organisation was steadfast on its duty in constructing an uninterruptible supply line and Mother Nature was teasing the human ingenuity with her frequent landslides. In about three hours from Joshimath we reached Malari; a quaint little village of probably a hundred houses with a small market along the main avenue. The areas before and after the village are populated with the encampments of various arms of the Indian Army. The ITBP post is located in a large compound, 2 Kilometers past the Malari village. There, we could see the little yellow tents erected by our logistics team from Crystal Adventure- Uttarkashi; who had already arrived there the previous evening. “सर पोर्टर नहीं मिल रहे हैं यहाँ पर. हमने सोचा था यहाँ से चार पोर्टर ले लेंगे .. पर कोई मिल ही नहीं रहा है ! ”- said Chandan Singh. Chandan owns Crystal Adventure and has supported all my trips in the last decade. “यह कीड़ा बूटी का season है सर. सारे के सारे गाँव के लड़के कीड़ा बूटी ढूंढने चले गए हैं ” he said. Keeda Booti is a herb, known for its economic value. Apparently it resembles a living insect (that’s why the name Keeda) and has extremely high value in Chinese markets. The aggregators from Delhi collect it from places like Malari and pay a good price for it. Easy money for the youth! “एक बार और कोशिश कीजिये और कोई लोकल guide को contact कीजिये”- I was irritated. This was the last thing I expected having warned Chandan umpteen times over telephone to be extremely careful about arrangement of the necessary manpower. 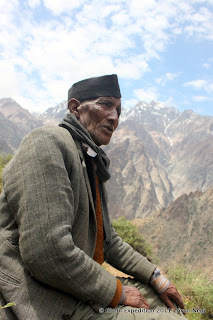 Two hours later we were sitting in a shop at Malari market, interviewing old Bhuwan Singh- Oldest shepherd in the village with 50 years of shepherding experience under his belt; in Girthi and Kio Gaad valleys and even in some pastures of Tibet. Soon we were back to the camp along with old Bhuwan, eager to get things packed up so that we could proceed to the campsite at Point 8. Jaisingh informed us that the ITBP personnel had been kind enough to provide 30 liters of Kerosene Oil and hadn’t even charged a penny for it. Considering that Malari was woefully short of fuel oil, it was manna from heaven. By about three in the afternoon, our convoy started off and in couple of hours the camp was established near the river bridge close to the milestone that says “Malari- 8 Kms”. The Dhauli Ganga roared close and it was a windy evening under towering rock pinnacles that define the 8 Point area. Late in the evening an Army Gypsy (Suzuki SUV) stopped near the campsite and a young officer alighted from the vehicle. It turned out that the young Captain from Army Engineers was just curious to see all the colorful tents of the expedition party. He was evidently happy to see people in the desolate country where his job was to construct a difficult road for the next one year. “I will see you guys tomorrow morning when you are crossing over to the other side of the river. May be I shall meet you on your way back from Sumna too! !” said the smiling officer as he left for Malari. 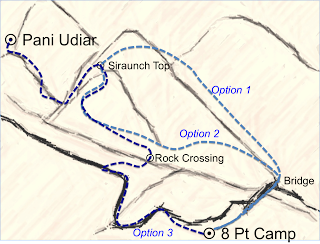 From the 8 Pt camp, on the right bank of Dhauli, there are three possible routes to reach Siraunch Top- an intermediate landmark en-route Pani Udiar. The usual route goes straight up from the left bank across the bridge to the crest barely visible and then drops down to Siraunch Top. This was the one used by Mr Kapadia’s team in 1986. The other alternatives to this, is to choose a point about 1.5 Kms ahead on the left bank to climb up. This apparently reduced the difficulty and magnitude of the climb. However, to reach that point on the left bank, one option is to cross over right at the 8 Pt Bridge and negotiate the entire 1.5 Kms through rock and scree. The other option is to continue on the main road on right bank for about half a kilometer and then cross the river over a natural rock bridge. We chose the last option after we saw a couple of shepherds using the rock bridge the previous evening. The porters were going to be heavily laden carrying almost 2 weeks of ration for a party of 26 people! Obviously any chance of easing the distance or altitude was going to be welcome. Walking on the main road ahead of 8 Pt Camp, it’s difficult to miss the large rock lying right at the center of the river with a red pennant fluttering over it. The whole of Dhauli Ganga almost disappears beneath it with an angry roar. The rock is almost 2 storeys high. Remnants of two worn out strands of 20 ft long Fibre Optic cables serve as a support for the local users to climb up and rappel down. Thankfully our team was equipped to reinforce the local contraption significantly. By the time we all arrived at the site, Jaisingh and Vinod had already fixed a complex maze of ropes and pulleys and were already transporting the expedition cargo to the other side. Apart from the sight and sounds of the river and a bit of a scare while rappelling down to the other side of the rock, everything went smoothly. When it was time to distribute loads to porters, we realized that the shortage in porter manpower was a real issue we had to deal with for the duration of the trek. For the time being it was decided to leave some loads behind and pick them back after setting camp for the day; after all it was only 5 Kms to Paani Udiar! Bhuwan Singh told us. Soon the climb commenced and the route went steadily up with exposed slopes to our left till we reached a small meadow after about a kilometer. “जब दलाई लामा इंडिया आये, उनके सारे रयत, प्रजा, घोड़े, बकरी.. सब यहाँ से आये थे ! सन ६२ की बात ठहरी!.." Bhuwan Singh was continuing in his inimitable style as we struggled to recover our breath. He was pointing towards the trail clearly visible on the right bank of the river coming all the way from the Lapthal area. Apparently the trail saw much action during the Chinese aggression and Dalai Lama’s flight from Tibet. After another hour of slow and grueling ascent we reached an area where there were some broken down sheds of shepherds and small fields cut for step-cultivation. We had reached the Siraunch Camping Ground. “मलारी वालों की खेत था यहाँ साब. अब तो कोई खेती नहीं करता. आज कल के लड़के पढ़ लिख कर शहर चले गए ” - Bhuwan Singh was bemoaning the fate of the deserted fields that used to grow Potatoes and Lentils at some point in history. Soon we reached the crest of the small spur we were upon where there were more shepherd huts. One could see several small holes dug into the ground, which would have served as temporary storage for potatoes harvested during the season, many years back. The long climb had left us thirsty, but there was no water anywhere; probably another reason why people might have abandoned cultivation at Siraunch. The only access to water here appeared further south, about a Kilometer away. 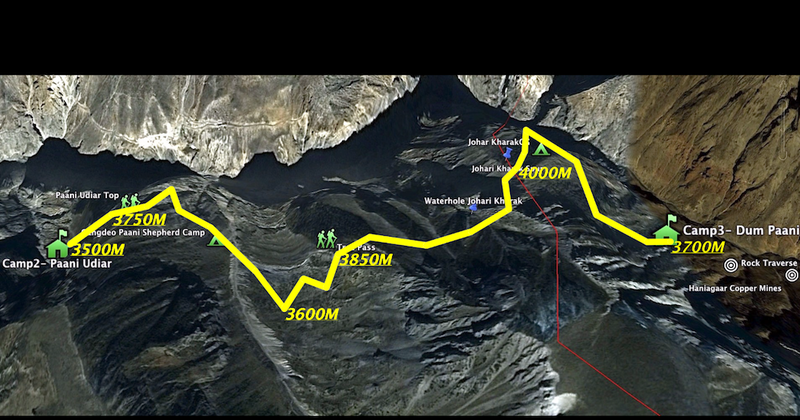 One could see an easy approach to the Siraunch Gad- the route taken by Mr Kapadia’s team. After a brief rest we decided to ration ourselves to small swigs of available water and push fast for the campsite. The frustration of not having water got compounded when Bhuwan Singh pointed at the route ahead. 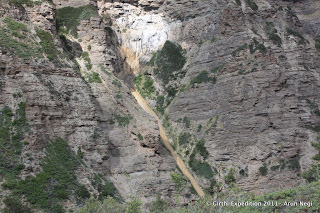 We had to go down about 200 Meters to Siraunch Gad where there was a natural rock bridge and then climb up another 250 meters to reach the campsite. The next half an hour was sheer struggle, getting down a dusty and slippery precipitous slope. The route was completely destroyed by the flock of goats that have been travelling ahead of us. The rock bridge at the bottom could have been easily missed but for the distant gurgle of the water beneath. Here, the Siraunch Gad cuts a thin passage through almost thirty meters of solid rock. The gap between the vertical sides of these rock walls is so little that the water flowing below cannot be seen! Straight ahead, the route wound steadily up. Shahid was ahead of the entire team and had almost half an hour lead ahead of all of us. “Dada! I have reached the campsite!” He radioed in after about half an hour. “Dada! यहाँ तो कोई पानी नहीं है ! There is no water here!” He said almost in the next minute. I was aghast. “यह क्या बोल रहा है? आप तो बोल रहे थे की पानी मिल जायेगा वहां ?” I asked Bhuwan Singh, walking few steps ahead of me. “पानी तो होना चाहिए साब. जा के देखना पड़ेगा ” – He answered calmly. “अगर नहीं हुआ तो आगे गंगदेवपानी चले जायेंगे ”- He was cool as a cucumber. After much anxiety we finally reached the Paani Udiar cave. “पानी तो है साब!”- Bhuwan Singh announced pointing at a spot towards the end of the cave shelter. Only then I understood Shahid’s dilemma. Bhuwan was pointing at a stream of crystal clear water as thin as a thread, dripping from the rockwalls of the Udiar. For most of us who have always seen a small stream or a pond of water to merit for being suitable for a campsite, this little trickle would surely have gone unnoticed! Here was an experience completely novel for me. Never ever have I camped in a cave that’s almost like a recess in a vertical rock face. There was just enough space for setting up few tents in the recess with almost a foot of space left for moving around. Thick shrubs ahead hid the near-vertical hundred-meter drop down into the valley below. As we got busy setting up the camp, a small team of four porters left with a radio and few bottles of water, for picking up the rest of the cargo we had left near the rock crossing in the morning. When we were calling it a day, these wiry Nepalese porters were just about 50 percent through with their days work! This wasn’t going to be a sustainable practice every day! In the evening, as the sun was setting down, we spotted a pair of Bharals engaged in cavorts upon the steep rock face ahead of us. Little did we know that they were the last of the wildlife that we were going to spot for the next 2 weeks! By the time we woke up next morning, we heard some conversation going on in the radios; a team of porters were coming back from a site about 4 Kms ahead after dropping 4 loads of ration. Vinod, the camp manager was trying his best to deal with the porter shortage by way of running a two-shift operation. The route ahead looked scarier than the previous day when we realized that we were going to follow the path of the Bharals, that we were so enthusiastically watching the previous evening. 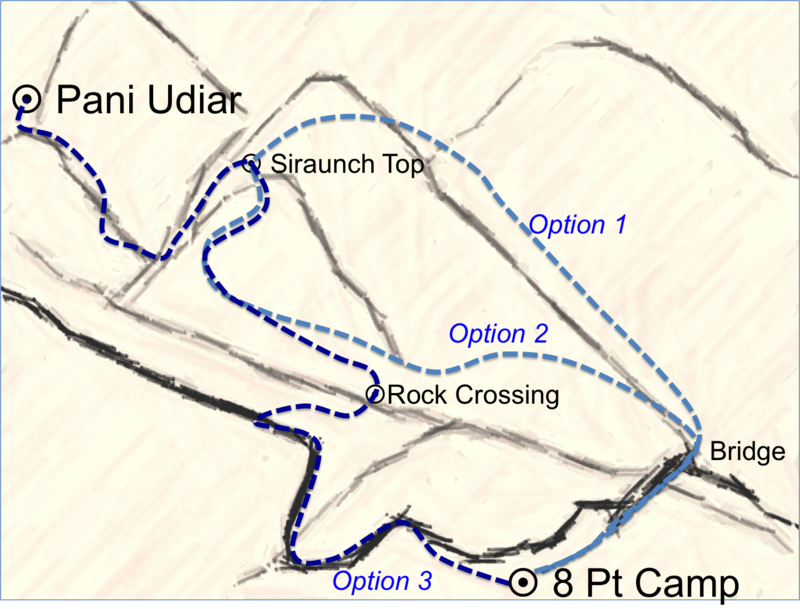 By about 0930 Hrs we were upon a high ridge from where we could see the Paani Udiar campsite and the Siraunch Top. Only from that vantage point could one actually appreciate the verticality one had managed in the previous 24 Hours. From this point onwards, the steep descent begins into the Gangdeopani valley. On the way we passed by the load of ration that was left early in the morning. They would have to be picked up sometime later during the day after we set camp at Dum Paani. “आगे का रास्ता कैसा है भुवन सिंह?” I asked, already tired after a tough climb and a fast descent. “अभी वो निचे जाना है बरफ में साब. वहीँ है गंगदेवपानी . फिर वहां चढ़ेंगे ऊपर जहाँ एक पेड़ दिखाई दे रहा है.....”- Bhuwan Singh rambled on nonchalantly. Essentially, we had to go down a hundred meters more to the valley bottom and then climb up another 400 meters till a high point marked by a lone tree, cover some level ground till Johari Kharak and then descend a few hundred meters to Dum Paani. The ordeal was about to continue for few more hours. The Glacier at the valley bottom provided the much needed water supplies. When we reached the “Tree-Top” two hours later, the view ahead opened up to reveal the towering rock pinnacles of the Rambhakot group. 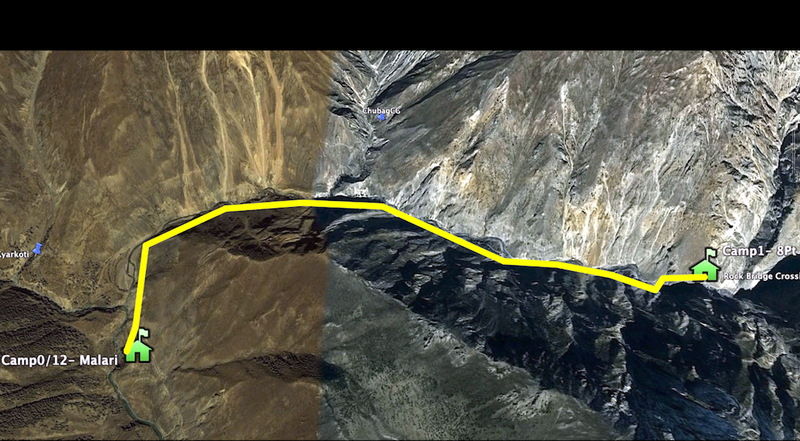 There was now a visible trail that meandered along easily to a spur about 2 Kms away. “वो है साब जोहारी खरक. .”- said Bhuwan Singh, pointing towards the rocky spur covered with patches of green. “अब तो बढ़िया रास्ता है, दूम पानी तक ....”- Bhuwan Singh himself was visibly happy. The trail now passed through sparse woods and ascended gently. 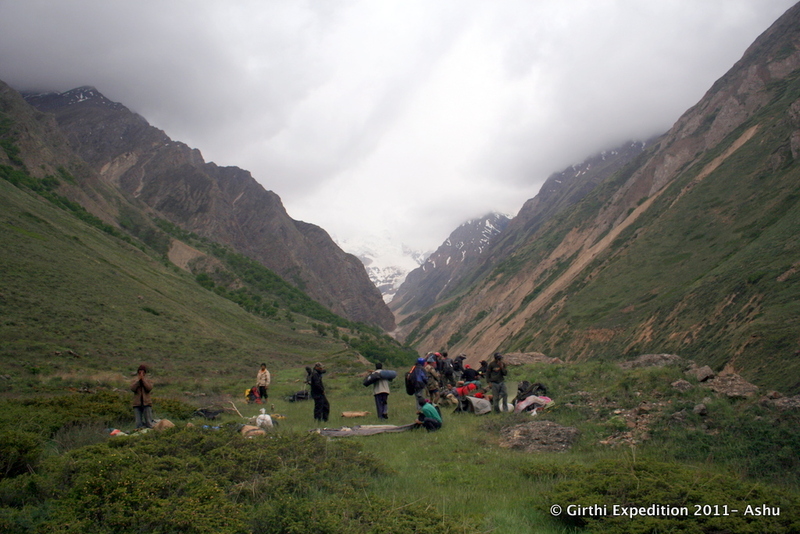 Johari Kharak is a small meadow and campsite, almost overlooking the confluence of Girthi and Kio Gad. At an altitude of 4000 meters it has a good green cover of grass and small shrubs. The place bears its name probably after the shepherds who might be coming in from the Johar Valley of Milam. Even as per the political map, the area to the North and East of this point belongs to the Pithoragarh district and not Chamoli. A good guess would be that this was probably the meadow that defined the boundary of shepherding rights of the people of Milam Valley, a possible explanation of the seemingly weird boundary demarcations of Chamoli and Pithoragarh. “वो निचे साब जोहारी खरक का पानी...”.Bhuwan Singh was pointing at another microscopic trickle, just about 50 meters below the route we had passed through. “पहले इस नाला में बरफ का पानी आता था.. अब सुख गया है..”.. He pointed at the small dried up bed of the stream we crossed to reach Johari Kharak. From here the route resolves itself sharply down and takes a turn to the right. As one turns, the entire valley of Girthi Ganga opens up; after two hard days of toil. The snowcapped peaks at the far end indicate the approximate location of Topidunga. We had roughly one week to reach there. We descended down rapidly for the next kilometer through a thin jungle, crossing a large flock of goats. We were going to share the campsite with the shepherds at Dum Paani. In half an hour we reached the small meadow besides a thin stream of water emerging from the dusty broken slopes. Bhuwan’s worries about finding enough space for camping was handled when the entire team chipped in for two hours to create a brand new campsite for 4 large tents! That night we slept to the sounds of jingling bells of the goats, occasionally woken up by the barks of the shepherd’s dog. The manpower problem did catch up with us finally. To better manage the transport of cargo, we decided to rest at Dumpaani whilst the porters went about the cargo transport in 2 groups. The ration loads left 5 Kms behind were to be brought in by one team and some cargo had to be transported to an advance point ahead of us at Sangla Palyo. This also would help in reconnoitering the route ahead we reckoned. 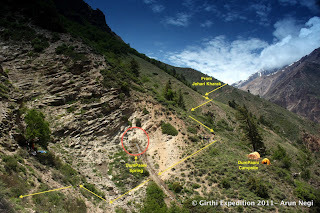 All our research and Bhuwan Singh’s narrative indicated that the next 6-8 Kms were the toughest in the Girthi traverse. Vinod went with the advance team for the recee. We watched the shepherd leaving with his flock in the early hours of the morning even before the porters left for Sangla Palyo. It was a lazy day of washing cloths, washing hair, having a bath and a shave by the streamside. 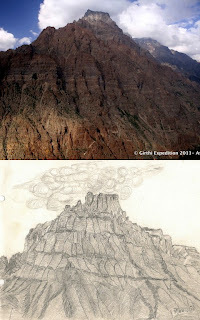 Kalyani went about doing her pencil sketches while many went photo-shooting. There was palpable anxiety all around about what Vinod would have to report in the evening. 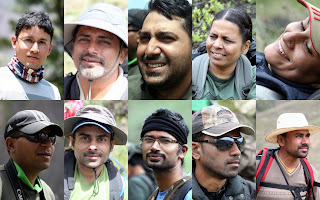 As the evening descended, Vinod arrived with his team narrating the travails that lie ahead. We had long hours of animated discussions planning the strategies to deal with the next day, around a blazing campfire. The next day broke sunny and clear. Starting off for the day, we had to do a steep descent and a traverse along an almost-vertical wall. Soon thereafter we were on a high ridge from where we could see the “Haniagaaar Copper Mines”. Atkinson’s gazetteer describes this as a Lead Mine, but Bhuwan Singh disagrees. Route Plan- Day 4 - The day of "ravines"
It’s a little meadow of about a few hundred meters square with a prominent depression in the middle. Not very far away is a little arch of stone – clearly indicating the existence of some man-made structure there. “वो ताम्बे का खान था साब... मलारी के लोग रहते थे वहां. ..नदी के उस पार गुफे में. ..पूल है वहां पर ..." Bhuwan Singh was describing how people used to mine and live there in the nearby caves. It was a strange feeling seeing the structural remnants of human endeavor in this most inhospitable part of the world. …and apparently, it was few hundred years old already!! The apprehension about the route vanished for a moment and one got lost in glorious moments of memory. "इसका नाम है अट्करा नाला. ..”..’Bhuwan was rambling on..
“अच्छा slope है....” Ritesh quipped with a wry smile as we approached a scary ravine. The Glacier over the streambed ahead was actually at an acute angle for traverse, at least it appeared so. As it happened all too often during those few hours, it looked scary for a while. But when you were in the middle of it, it was all focus and mindfulness for the task at hand and before one realized the patch was through! The next challenge was a big hollow with a huge frozen glacier, along a steep hillside! 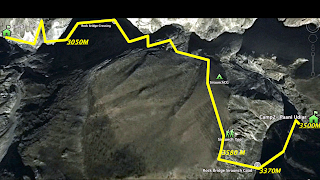 One had to descend all the way to the bottom of the hollow till the glacier, cut a transverse path across it and climb the far side slope, which rose up in an impossible gradient. Later I realized, it was actually the place that we had been examining from Dum Paani all through the previous afternoon. Apart from the extremely laborious ascent up the far side, the whole traverse happened relatively quickly, without any incident. Soon the valley opened up to reveal the distance all the way till Topidunga. The path ahead looked relatively simpler. “बस एक खंगार पड़ेगा आगे .” Bhuwan said. “Rope लगाना पड़ सकता है वहां”. Khangar in the local dialect is a slippery, dusty and rocky exposed scree slope. The descent was fast and we reached the next campsite Sangla palyo before noon. There was a water source nearby which enabled us to have an early lunch and leave for Senyurpaani. The porters were already acting up about the load and the distance and I had to express my irritation in a fairly aggressive manner to prod them forth. It made sense. 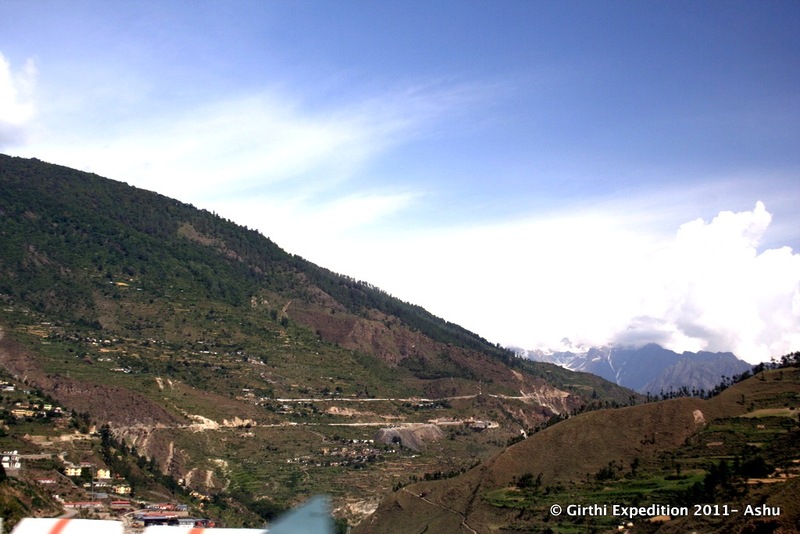 The entire Girthi valley is in the rain shadow of the Nanda Devi sanctuary, with such mighty peaks as Hardeol, Trishuli, Kholi and Rishi Pahar standing in the way of the northerly movements of the monsoon clouds. The Topidunga area is however at a closer reach of the Milam valley which is open in the South Easterly direction. That’s the angle the monsoon clouds in the Himalayas roll in from. 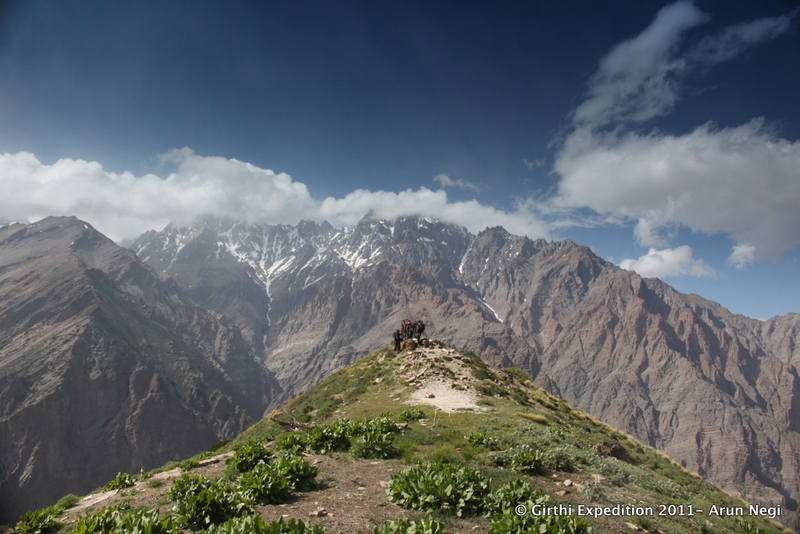 An hour later we reached the Khangar Traverse, where we spent some nerve-wrecking moments. It is a highly exposed slope made of gravel and hard soil that’s extremely hard to hold on to. There was no route over it; even if there was one, it had now vanished after the flock of goats had passed across it the previous day. In the mountains, where the trails are not very well defined and well made, one passage of a flock of 100 heads of goats are enough to make the trail disappear. 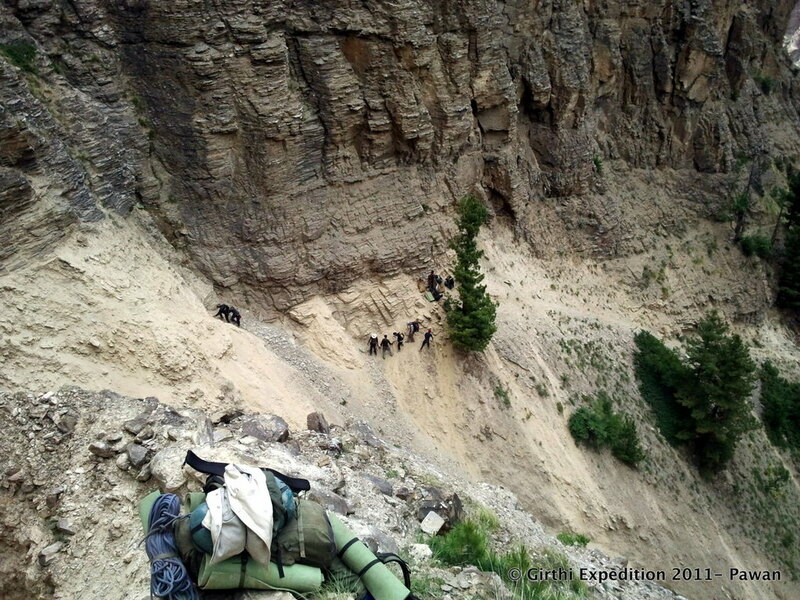 With bit of effort and lots of anxiety, the team crossed over the Khangar traverse slowly. “अब कोई danger नहीं है... गिर्थी तक रास्ता बढ़िया मिलेगा ” Bhuwan was continuing his running commentary. The rock wall on the far side of the river was now slowly changing its texture. One could now see the steepness of the wall ease a bit. In regular intervals were age-old sulphur flows, indicating the existence of hot springs at some point in the past. The layers of rocks on that wall created caves and overhangs, small and large that might provide shelter to the local fauna. 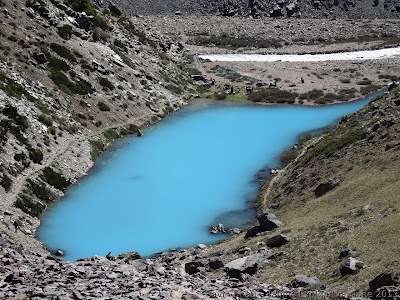 The trail soon emerged into a grassy clearing by the side of a glacier stream. This was the targeted campsite for the day- Senyurpaani. But there was a minor problem. The Glacier was a continuous frozen mass, providing no access to the water underneath. The team was still far behind when the advance party comprising Bhuwan, Vinod, Shahid, Suraj and Myself started weighing our options. “Why don’t we proceed to Girthi?” opined Shahid. “But we have to wait for the porters to arrive!” Suraj retorted. Shahid made some comment about the porters not walking faster and how they are jeopardizing the team mission. Suraj had his own opinion about it and soon both of them got engaged in a sharp and loud verbal duel! As it often happens in the high mountains, we are always fighting a battle within, in our minds; a tussle among what you want to do, what your body thinks it can handle and what the circumstances are permitting you to do. In such highly-strung situations, it’s quite easy for minds to clash, amongst team members. They do not matter as long as they are temporary and as long as people find more alignment with the purpose than in the conflicts. Bhuwan Singh came to the rescue again with his intimate knowledge of the terrain. “थोडासा निचे एक उड़ार है.. वहां पानी मिल जायेगा .. .” He wasn’t ever perturbed about availability of water in this valley, which was famous for water scarcity! It was as if he could manufacture a water-source at will!! We finally called it a day at “Senyurpani Udiar” nestled prettily beside a small waterfall. The Girthi river flowed tempestuously not very far away, its waters almost looking black with all the silt it was carrying. We thanked our stars; we didn’t have to use that muddy and dark water. Jaisingh and Janak slept in the open that night with a bright campfire blazing nearby. Jaisingh can track a bear from a kilometer, as I have seen in my earlier trips. He felt, it was better to light a fire, lest the hairy customers decided to pay a nocturnal visit. 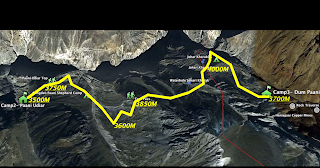 The Girthi Valley traverse is like a decathlon; it’s a series of a variety of challenges. Till Senyurpaani, the challenges were about heights, exposed slopes, slippery trails and precipitous drops. 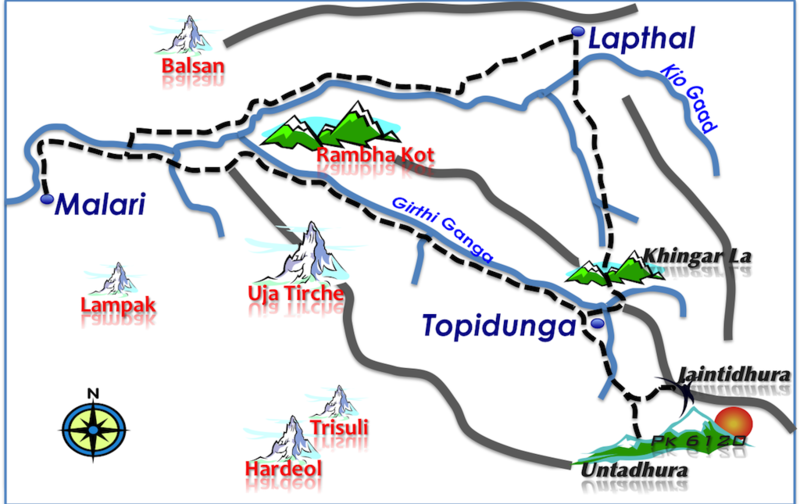 But just after, the challenges are about rivers and waters since the trail now proceeds very close to the Girthi Ganga. One has to negotiate snow bridges, walk on the riverbed (which might be inundated due to some freak flash flood) and Nullah crossings. In fact, Senyurpaani onwards, one has to cross at least one river a day for the next 7 days, on the route that we were about to follow. After an hour of easy walk by the raging Girthi, we reached the Dudhagarhi Nullah. Just after crossing the stream there is an interesting spectacle to be seen. A hundred meters upstream of the Dudhagarhi confluence, the Girthi passes through a narrow gate of two vertical rock faces, spaced some 6 feet apart. The entire volume of the river passes through this narrow passage. It would be difficult to imagine how deep the river would be at that spot! How and when that structure evolved, is anybody’s guess. 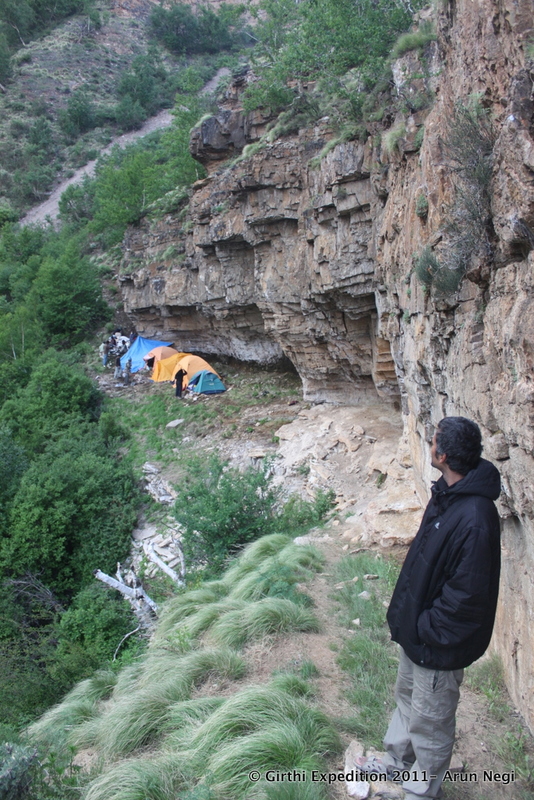 To reach the Dudhagarhi camping ground, one has to climb a hundred meters to reach a high ground. Not far away is the verdant meadow where the dense jungle around has thinned out into a clearing. The 1986 expedition had used this as their campsite. After Dudhagarhi, the route eases out yet again till one reaches a point where the Girthi turns its course almost at a right-angle, passing through another gate of thinly separated rock-faces. Up above, these rock-walls are joined by a log-bridge. “यहाँ से 'लप्थल' के लिए रास्ता निकलता है साब. 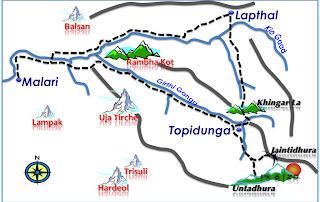 .. सीधा ऊपर को रास्ता जाता है, फिर pass के बाद Ruli Bagad में उतरता है. बकरीवालों का ration आता है इस रास्ते से” Bhuwan informed. Apparently the route beyond the log bridge proceeds vertically up on the far bank and crosses a pass and then drops to a point called Ruli Bagad (Bagad in local language is “riverside camp site”) on the banks of the Kio Gaad. Horses carrying ration climb up from Ruli Bagad till the pass and the shepherds from Girthi Valley meet them there, using this log bridge, to pickup the cargo. Soon thereafter, we arrived at “Girthi Udiar”- The Girthi cave shelter. The walls were full with graffiti of the previous ITBP – Long Range Patrol. Nearby were few shepherds, enjoying the sunny morn with a fire smoldering alongside. “बस थोडासा चढ़ाई ..और फिर गिर्थी !!”.. Bhuwan was happy. “गिर्थी में देवता को एक बकरी बलि चढ़ाना पड़ेगा साब”. He was already preparing his plans for a hearty meal of mutton. When Bhuwan got into his story-telling mode it was quite easy for him to get a captive audience. After his dramatic rendering of the local folklore, we decided that it was best not to visit the temple and bear corrupting thoughts in our city-bred minds about stealing coins. An hour later, we were upon the beautiful meadow of Girthi. Earlier I had asked Bhuwan once- Why do they get their flocks through such difficult terrains, when there were so many pastures available in and around Malari? “साब, गिर्थी का घास का एक खासियत है. यहाँ पर तीन महीने आप बकरी छोड़ दो.... ये बड़े बड़े हो जाते हैं! काले काले सिंघ और बहुत सारे बच्चे!! ” He was explaining to me the economics of the shepherd. They get them here because, they have a healthy growth and they multiply rapidly. After few months, when they herd them back, their economic value goes double or triple at times! According to the shepherd community of Malari, Girthi bears “Complan” for the goat kids. Resting there among the tall grass of the meadow we could understand some of the shepherd logic. The place indeed looked verdant. The ruins of some century old huts bearing testimony to that fact stood forlorn to our left, upon a ridge that overlooked the confluence. The Girthi ruins- centuries old! “पता नहीं साहब. जब से हम देखे हैं तब से ऐसा ही है. ..मलारी वालों का ही था. ..हमारे परदादा के ज़माने से भी पहले की बात है ये !" I did a quick calculation. Bhuwan Singh’s Pardaada (Great Grand father) would have been born around the 1850s. It was still in ruins around 150 years back! We were looking at some history, at least 200 years old! 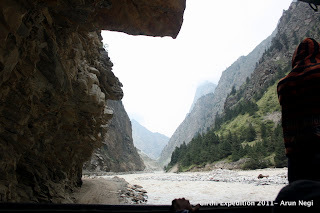 The Girthi river danced down a flat bed about a hundred meters ahead. The waters didn’t look too furious. We decided to cross over and camp on a pretty looking site on the right bank. We decided to accede to Bhuwan’s religious sentiments, which had motivational by-products for the porters. A goat of reasonable size was purchased from the shepherd and Shahid did the honors for the sacrifice. The porters had a party with plenty of mutton. I am sure they would have loved some local brew to go with it. I keenly follow your posts and enjoy all the details of expeditions. And strangely enough we have one association at Kolkata named HIMAPATHIK. Thanks ! !